Heat oven to 350°F. Line shallow roasting pan with foil. Place beef, fat side up, in pan. In small bowl, mix salt, thyme, garlic powder and pepper until well blended. Sprinkle and press herb mixture on roast. For medium-rare, roast uncovered 1 hour 45 minutes to 2 hours 15 minutes or until meat thermometer inserted in center reads 135°F. 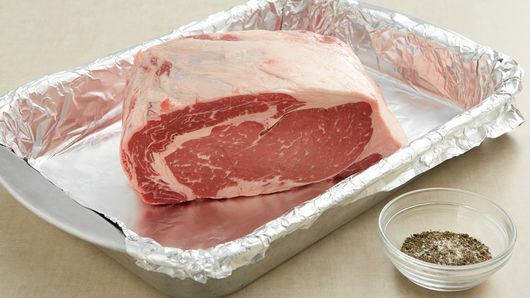 For medium, roast 2 hours 15 minutes to 2 hours 45 minutes or until meat thermometer inserted in center reads 150°F. Cover roast loosely with foil; let stand 15 to 20 minutes before carving. 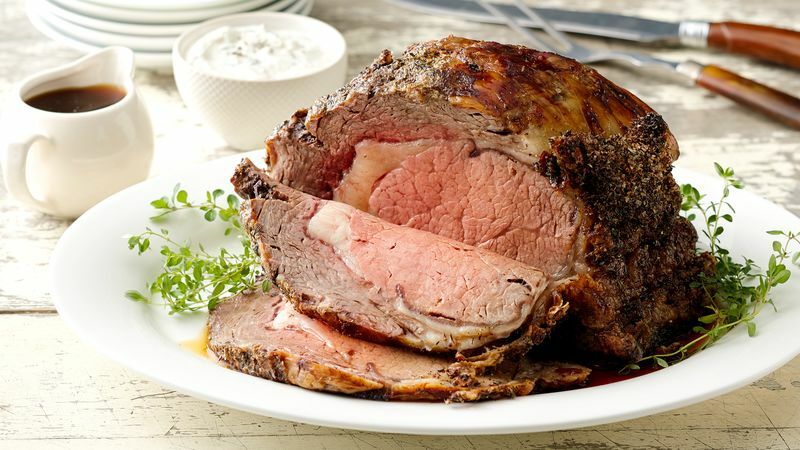 Try any of these delicious sauces for your prime rib. •For Creamy Horseradish Sauce, stir 1 cup sour cream, 2 tablespoons fresh ground horseradish, 1 tablespoon chopped fresh chives and 1/4 teaspoon coarsely ground pepper until well blended. •For Creamy Pesto Sauce, stir 1 container (7 oz) refrigerated pesto and 3 tablespoons sour cream until well blended. •For Blue Cheese Sauce, stir 3/4 cup crumbled blue cheese, 1/2 cup sour cream, 2 tablespoons milk and 1/8 teaspoon red pepper (cayenne) until well blended. •For Au Jus, in 1-quart saucepan, mix pan drippings from roast, 1 cup beef broth and 1 teaspoon Worcestershire sauce. Cook over medium-high heat 8 to 10 minutes or until reduced by half.